PhD, Complex Analysis From IIT BHU , 2010. M.Sc, Mathematics From BHU, 2005. B.Sc, Physics, Maths and Computer Application from Allahabad University, 2003. 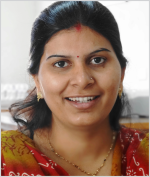 OP Jindal University, Raigarh (C.G), Working as a Assistant Professor (Sr. Grade) from August 2009 to till date. Univalent and Multivalent functions, Differential Subordination & Superordination. P. Sahoo and Saumya Singh, Fekete-Szegö problems for a special class of analytic functions, published in Journal of the Orrisa Mathematical Society, 27(2008), 53-60. P. Sahoo and Saumya Singh, Starlikeness conditions for an Integral Operator, published in Journal of Inequalities in Pure and Applied Mathematics, Volume10, Issue 3, article 77, 2009. P. Sahoo and Saumya Singh, Application of Differential Subordination for Starlikeness criteria for Analytic Functions, published in Bulletin Of Calcutta Mathematical Society, Volume 101, Issue 6(2009), pages 607-614 . P. Sahoo and Saumya Singh, On a class of Harmonic Univalent functions Defined by a linear operator, published in International Journal of Pure and Applied Mathematics(Bullgaria), Volume 63, Issue 2 (2010). P. Sahoo and Saumya Singh,On a class of Multivalent functions With negative coefficients, published in Journal of Indian Academy of Mathematics, Volume 32, Issue 2(2010). P. Sahoo and Saumya Singh, On a class of Meromorphic p-valent functions, published in Journal of Indian Academy of Mathematics, Volume 33, Issue 1(2011). P. Sahoo and Saumya Singh, Some Subordination properties of generalized Jung Kim Srivastava Integral operator, published in Mathematical Inequalities and Applications, Vol. 14, Issue 4(2011), 957-966. P. Sahoo and Saumya Singh, Some starlikeness conditions for the analytic functions with missing coefficients and integral transforms, published in Journal of Nonlinear Analysis and Application, Volume 2011, Year 2011, Article ID jnaa-00091. P. Sahoo and Saumya Singh, On a Class of Analytic Functions Defined by an Integral Operator, published in Hindawi Publishing Corporation Journal of Mathematics Volume 2013, Article ID 923167, 4 pages. P. Sahoo and Saumya Singh , Some Criteria of Starlikeness for an Integral Operator, published in Recent Advances published in Proceedings of the National Conference on Recent Advances in Mathematics and its Applications, February 2013, ISBN:978-81-8424-821-0. P. Sahoo and Saumya Singh, On a Generalized Subclass of Analytic and Bi-Univalent Functions, published in Applied Nonlinear Analysis Volume 24(2017), Number 1, 82-90. P. Sahoo and Saumya Singh, Coefficient Estimates for Some Subclasses of Analytic and Bi-Univalent Functions, published in Palestine J. Math., Vol. 6(Special Issue II)(2017), 112-116. M. Darus and Saumya Singh, On Some new classes of Bi-Univalent Functions, Accepted in JAMSI. Presented a paper titled On Certain Class of Multivalent Functions with Negative Coefficients in National Conference on Modern Analysis and Allied Areas held on February 23-24, 2007 at the Dept. of Mathematics, Banaras Hindu University. Presented a paper titled Some starlikeness conditions for the analytic functions with missing coefficients and integral transforms in NMRSMS-2007, a National Meet of Research Scholars in Mathematical Sciences held during October 30-November 3, 2007 at the Dept. of Mathematics, Indian Institute of Technology Kanpur. Presented a paper titled Application of Differential Subordination for Starlikeness criteria for Analytic Functions in Sesquicentennial celebrations(1857-2007), a International Seminar On Foundation Of Mathematics, Analysis and Geometry held during December 12-14, 2007 at the Dept. of Pure Mathematics, University Of Calcutta, Calcutta. Presented a paper titled On a class of analytic functions defined by an Operator in 23rd Annual Conference of the Mathematical Society held on December 29-30, 2007 at the Dept. of Mathematics, Banaras Hindu University, Varanasi. Presented a paper titled On a class of Meromorphic p-valent functions in NMRSMS-2008, a National Meet of Research Scholars in Mathematical Sciences held during December 6-December 10, 2008 at the Dept. of Mathematics, Indian Institute of Technology Kanpur. Participated in 24rd Annual Conference of the Mathematical Society held on December 30-31, 2008 at the Dept. of Mathematics, Banaras Hindu University, Varanasi. Participated in International Congress of Mathematics, held on August 19- August 27 2010 the Dept. of Mathematics, Hyderabad University, University. Presented a paper titled New starlikeness conditions for meromorphic functions, International Conference on Innovation and Research in Technology for Sustainable Development, O. P. Jindal Institute of Technology, Raigarh, November 1- 3, 2012. Presented a paper titled Presented a paper titled On a class of Harmonic Univalent Functions Defined by a Linear Operator, International Conference on Mathematical Sciences, S.S.E.S. Amravati’s Science College, Congress Nagar, Nagpur, December 28- 31, 2012, Invited Presentation. Presented a paper titled Some Criteria of Starlikeness for an Integral Operator, Recent Advances in Mathematics and its Applications, Department of Applied Mathematics, Indian School of Mines, February 14- 16, 2013, Invited Presentation. Presented a paper titled On a Class of Bi-Valent functions, National Conference On Applications of Mathematics in Engineering and Sciences, Department of Applied Mathematics, MNNIT, Allahabad, November 29-30, 2014, Invited Presentation. Presented a paper titled On two new subclasses of Bi-Valent functions, International Conference on Geometric Function Theory and its Applications (ICGFTA-2014), Department of Mathematics, Indian institute of Technology, Kharagpur, December 18-21, 2014, Invited Presentation. Participated in Advanced Training in Mathematics for Lecturers(ATML), held on March 16- April 4-2009 at the Dept. of Mathematics, University of Delhi, Delhi. Attended one day Faculty Development Program on “Mind Mapping” organized by Department of Humanities, at OPJIT, Raigarh, in 2014.
International Women’s day award for being a role model of change for women’s equality at OP Jindal University, Raigarh. Life Member of Indian Society for Technical Education.